The countdown to the opening of the road that will connect the island with Fonsalía ring on the coast of Guia de Isora, has already been activated. This week have begun the construction of the roundabout known as Fonsalía branch that will connect the TF-47, which runs along the coast, with the new highway. 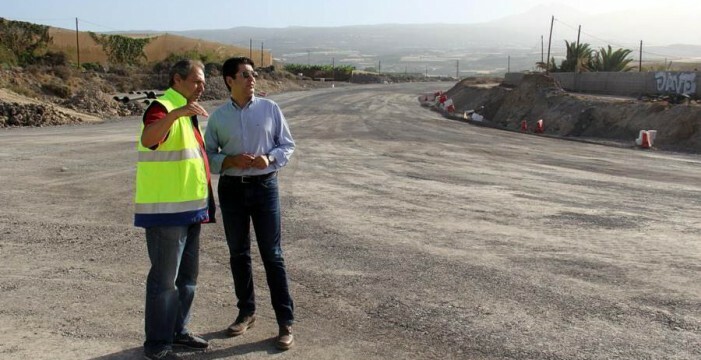 The Director General of Tenerife Road Infrastructure, José Luis Delgado, who visited on Monday the works accompanied by the mayor of the municipality, Pedro Martín, said the new section is “probably the most important ring” in the sense that it will allow all traffic flowing through the coast between Adeje and Los Gigantes which over 30,000 vehicles daily access directly from the highway to the coast. Both the Ministry of Public Works as the municipality of Guia de Isora agree that the opening of this route will be an improvement not only in communications between the midlands and the coast, but also allow an important outlet for connections Freshwater cores, Stone Hincada and Tejina. The mayor of Guia de Isora, Pedro Martín, stressed the high volume of traffic that support these local roads to be the fastest ways to connect with the ring roads. City Councilman did not hesitate to describe as “historic landmark” entry into service of the new infrastructure “because he has been an area often neglected in terms of road investment is concerned.” He also stressed “the momentum will this connection to guide economic development, the coast of Santiago del Teide and certain areas of the coast of Adeje”. On the other hand, the mayor of Guia de Isora recalled yesterday that the City Council has long called for a route that bypassed Alcalá to avoid traffic jams formed in the coastal town. Pedro Martín stressed the “priority” nature of this work and noted that the council has scheduled the drafting, but was in favor of insisting, as it is convinced it will be a process of “lengthy and expensive” processing. As for those estimated by the Ministry of Public Works for the branch Fonsalía installments, the first week of September is scheduled to begin traffic diversion by a parallel to the current up to the gas station located between Fonsalía and Alcalá road. If all goes as planned, the branch and the roundabout will be operational in November 2016. Besides the construction of the main work, which is the descent from the trunk of the highway to the coastal area of Fonsalía, where the future commercial, sport and fishing port that will connect to the western islands will be built, there are other works of minor showiness but of great importance for the municipality of Guia de Isora. This is the case of the roundabout, which is already working, located in the TF-82 road at the entrance of the town of Guia, at the end of the so-called Rambla de Guia de Isora, linking the town with the highway TF-1 from the last 30 January. This new roundabout access and allow “safe and comfortable” for vehicles that are incorporated from the ring to the center of town Guia de Isora or towards the towns of Chiguergue and Chío, highlights the City Council in a statement.